GOTHENBURG, Sweden, May 9, 2012 (ENS) – As the climate warms, plant species that prefer a colder environment are disappearing from the mountain ranges of Southern Europe. Since many of these species have small distribution areas, they are now threatened with extinction, according to two new studies from European researchers. Published in the journals “Nature” and “Science,” the studies are part of the broader Global Observation Research Initiative in Alpine Environments, or GLORIA. Today, GLORIA is a mega-network covering all the world’s mountain regions, but it is GLORIA’s original European arm that has reached a stage where researchers have started to observe changes. 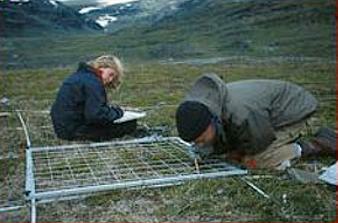 Over a period of 10 years, researchers around Europe have gathered samples from 13 different mountain regions. Using digital technology and intensive on-site field work, they have been able to study a grid pattern of square meters, selected on different high mountain summits, from the treeline up to the highest peaks. The digital photographs provide a detailed picture of which species have disappeared between 2001 and the present day. Today, the researchers are able to observe that species are migrating upwards and that the variety of species in Southern European mountain regions has declined during the 10 years in which samples have been taken. 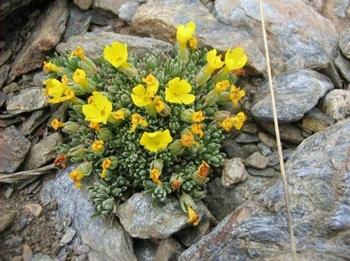 “This finding confirms the hypothesis that a rise in temperatures drives Alpine flora to migrate upwards. As a result, rival species are threatened by competitors, which are migrating to higher altitudes. These changes pose a threat to high-mountain ecosystems in the long and medium term,” the authors state. In Spain, researchers at the University of Granada participating in the GLORIA study confirmed that climate change is causing plants to migrate to higher altitudes. This study analyzed species diversity shifts in 66 summits of 17 European ranges between 2001 and 2008. On the Iberian Peninsula, two target regions were selected – Ordesa in the Pyrenees and Granada in the Sierra Nevada. Researchers found that the species under study had migrated an average of 2.7 meters (8.85 feet) upwards. The study also reveals that the number of species growing on the summits of European mountains has increased an average of eight percent over the seven year study period. Yet the scientists say this increase is not general. Of the 66 peaks in boreal and temperate areas, the majority revealed an increase in species diversity. In the Mediterranean area, eight out of the 14 summits studied showed a decline in the number of species represented. The mountains that present the most significant shifts in species diversity are Mediterranean mountains located in Southern Europe, where climate is different from that of the rest of Europe. In general, moist-soil species are more vulnerable to climate change, though high-mountain endemic species are also affected. The University of Granada research shows that species diversity has changed more at low elevation sites in the Mediterranean region than in other regions. In the Mediterranean mountain ranges of Sierra Nevada, Corsica, Central Apennines and Crete, the rise in temperatures is causing a decline in annual average rainfall, which results in longer summer droughts. As a result, temperature increases and droughts are threatening unique species found nowhere else on Earth. “For example, in Sierra Nevada, the observation plots revealed a decrease in the number of emblematic species such as Androsace vitaliana subsp nevadensis, and Plantagonivalisy Artemisia granatensis,” said Professor Joaquin Molero Mesa at the University of Granada. Artemisia granatensis is a sub-species of the marsh gentian endemic to the Sierra Nevada. The University of Granada research group has coordinated with the Observatorio de Cambio Global de Sierra Nevada, and has established, in collaboration with a research group from Morocco, another target region in the high Western Atlas, where observation plots and thermometers will be installed next summer.